If they gave a Pulitzer Prize for grocery stores, Raine’s Market in Eureka would have won it already. It is an amazing store. In its 19th century building — pressed tin ceiling, oiled wood floor — it provides for the needs of a few hundred people in this isolated community with precision and flair. For example, the meat department offers an array of fresh meats, but also a home-made chorizo you’ll find yourself bragging about, and if you’re a hunter they’ll process your deer. Fresh fruits and vegetables, canned goods are stacked on shelves, some of them in aisles, others tucked into the nooks crannies of the old building. And there’s Ruby Mountain beer in the cooler. Robin needed some baking supplies and of course they have parchment paper. The aluminum foil is “over there by the pelt.” Because besides being a marvelous market, Raine’s is a major showcase of hunting trophies: animal heads and skins. 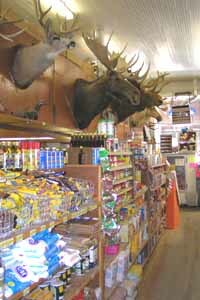 Moose, deer, mountain lion, antelope, elk, bear — all gaze serenely down on the humankind grazing through the aisles, browsing in the shelves, finding nourishment for ourselves and our families. But wait, there’s more: you can clothe yourself too, with Wrangler jeans and thermal jackets this time of year, t-shirts and sweat shirts during the tourist season. On top of that you can buy presents for the kids, a miniature tea set over there, a pint-sized fleece-collared flight jacket over here. And on top of that, all the people working there are friendly and helpful. Very cool. 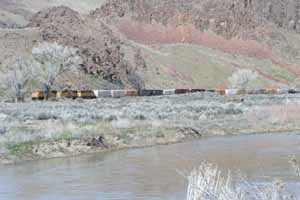 Another train along the Humboldt River through Palisade. outdistanced us as we passed from Diamond Valley with its scatter of modest homes and alfalfa farms into Garden Valley with cattle ranches here and there along the road, and then into Pine Valley. We turned off to spend a few minutes in Palisade, remembering an earlier visit when Chris was 3. He’s 16 now, and Palisade has been spruced up some since then. Palisade is basically one big residential compound, kept awake all night by the passing trains; the dugouts survive, and there’s a small cemetery to explore. We took his picture on the same crumbling steps we did then. Carlin is about as you remember it. The old railroad-dominated 19th century downtown is crumbling even further, the residential neighborhoods across the railroad tracks, are a little greener, and Chin’s is still serving Chinese food. There’s a big motel at the access ramp to Interstate 80, which we took east for the last 23 miles to Elko. Stockmen’s and Commercial are still going strong, so are Capriola’s Saddle Shop, Anacabe’s Elko General Merchandise, and the Star Hotel but it’s unmistakably modern too, with Yuppie Row on 5th Street, Cucina Fresca around the corner on Idaho, and lattes everywhere. And the magnificent Ruby Mountains, already white with the first snows of winter, press up against the southern sky like Alps. Wow. Jack’s Bar is Jacques’ bar now, and the sign has come down. The most characteristic landmark in this interesting melange of old and new is what used to be called Jack’s Bar, next door to Capriola’s on Commercial Street. Up until a few years ago this place sported a neon sign, a cloud of smoke enveloping the bar and an elderly clientele smoking cigarets and sipping Budweisers. Jacques Errecart at DLC Gallery. Now it’s a combination art gallery and wine bar, with Poetry Night once a month and what they’re sipping came from the Napa Valley or France. The bar provides a rich selection of tasty varietals, and the gallery provides a vivaceous display of art, most of it from local and nearby artists. 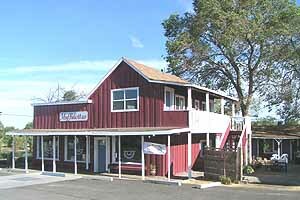 Across what was once the railroad switching yard and is now a parking lot the size of Nye County, the Western Folklife Center occupies the old Frontier Hotel building. 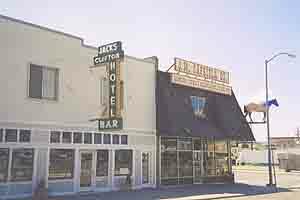 The hotel closed out its career with the passing of the Age of Cattle, and this multi-faceted organization operates a Gift Shop and Gallery at street level, both of them enjoyable to visit. When we stopped in the Gallery was being rebuilt for the upcoming Cowboy Poetry Gathering (more details below). On the near east end the Northeast Nevada Museum is definitely worth a visit. The exhibits range back into prehistory, and the gift shop offers an interesting combination of gifts and books, including used Nevada books. I was thrilled to find a copy of An Editor on the Comstock Lode, the Wells Drury memoir of his Nevada years (It begins: “‘Can you shoot?’ questioned Alf Doten as I stood before him, asking for a job as a reporter, in the little grimy office of the Gold Hill News. ‘Will you stand without hitching?'”). A few of the specimens. 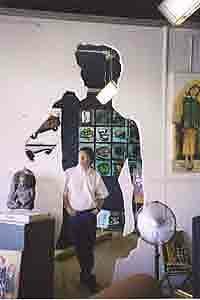 The museum also contains the Wannamaker Wing, possibly the creepiest space in the state outside the caverns within Yucca Mountain. I know other people feel differently, but this large room filled with dead animals, stuffed and posed to appear alive in carefully imitated environments makes me inexpressibly sad. 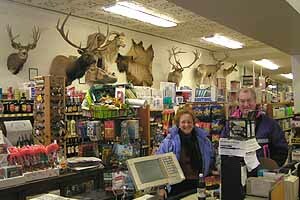 I know the hunting trophies on the walls of Raine’s Market are just as dead, but the warm and lively nature of the store gives them a benevolent air. 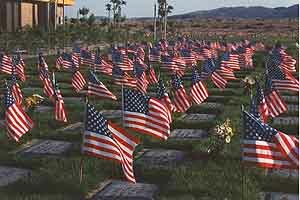 This is a mausoleum. 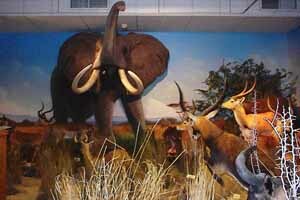 A chill pervades the display and people lower their voices, sometimes to whispers, as they tiptoe through, glancing furtively at the dead creatures, from the massive elephant head to the tiny dik-dik. How does he have the nerve to appear after leaving poor wax Angelina at the altar. 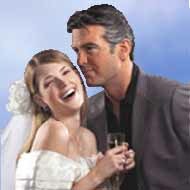 George Clooney stoically greeted a succession of ‘brides’ in the next room. I can’t help noticing that the waxen cad Brad Pitt had the impertinence to stand looking on while poor Angelina, fresh from cancelling the wax flowers, food and minister, was introduced all alone to her fans. I swear she showed signs of melting. And where was the Best Man, the recently-sculpted George Clooney through all this? He was idling in the next room where excited customers were putting on wedding dresses in eager anticipation of a quick snapshot with him. Is it just me, or does that seem unfeeling? Sheriff Stone writes from Gold Point that he and Red Dog Lil will again send out historical 1940’s Christmas cards this year. They were originally sent to the Wileys in Gold Point, who saved them all. “I had one friend call me up and said it was the first time he received a Christmas card that was older than he was. He got 1946. We also had a couple that wrote us back saying their 1946 was the same year of their birth. 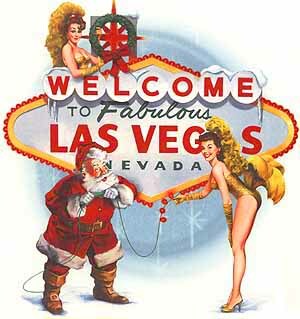 No, this isn’t one of the Wileys’ cards, it was sent a few years ago by the LVCVA. I liked it too much to throw it away. Here is a 3-minute video Bart Bischoff made about Gold Point a few years ago when he worked for KLAS in Las Vegas (He’s in San Francisco now) . . .
On the way back from Pyramid Lake the other day we disovered a new restaurant in Wadsworth: Muffuletta’s, serving up delicious New Orleans lunches and dinners and occasional special events like “Murder Mystery Night”, “Dinner & Seance” and “Cowboy Poetry & Balladeer Night”. 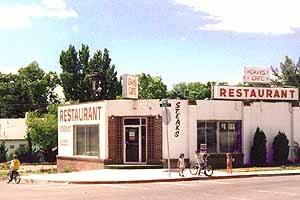 Yes, as a matter of fact I did say Wadsworth, and the Shrimp Gumbo they serve on Fridays is trés bon (775-575-0134) . . . Here they come again — the cowboy poets galloping our way, getting ready to gather in Elko for the 23rd time January 27 through February 3. Ticket information is here, and you candownload poetry podcasts here. people who help sustain open spaces in the West, and celebrate the age-old tradition of producing food. The 2007 Gathering will include tours of area ranches, cooking workshops by ranching families, and a panel discussion among top writers in the West. The Gathering will feature performances by more than 60 poets, musicians and musical groups, including new faces and returning favorites. Some workshops and shows are selling out fast, so buy your tickets early . . . Sourdough Slim was one of the stars of last year’s Gathering, and if you can’t wait until January or can’t get to Elko, you can see his 2001 performance at the Kennedy Center in New York . 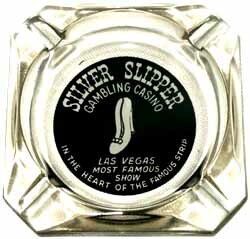 . .
Here’s a website I never expected to see, on a Nevada topic I never imagined existed — Nevada casino ash trays! And it’s a very cool site . . . The Genoa Country Store’s new partner, Vince Robertson, is from Scotland and will add Haggis to the Wednesday night menu soon. Monday and Wednesday night dinners and Friday Happy Hour continue at 5:30 pm . . . Plan ahead: Smokey Robinson, recently honored by the Kennedy Center for the Performing Arts with a prestigious lifetime achievement award, will perform at Harrah’s Lake Tahoe on Jan. 27 and the Yardbirds on March 31 . . . The Carson Valley Inn is offering a magnificent variety of special New Years Eve menus at each of its restaurants.